Surabaya, November 30th, 2012 – During this year's Aston Week Surabaya, an annual trade show that brings representatives of more than 60 Aston managed Hotels and East Java's Travel Trade and Media Communities together, Aston International announced plans to open 40 new hotels in 2013. The new hotels include a wide range of properties such as Aston's first 4-star life style Alana Hotel which is set to open in February in Seminyak Bali, several 4 star Aston and 3 star Aston City Hotels which are set to open in Belitung, Bekasi, Bojonegoro, Jambi, Jember, Kupang, Lampung, Madiun and Solo, 1 trendy 3 star Quest Hotel on Jalan Mangkubumi in Yogyakarta and numerous select service favehotels and superior select service Hotel NEOs including 9 in Jakarta, 5 in Bali and others in Balikpapan, Bandung, Lampung, Malang, Medan, Palembang, Samarinda and Semarang. While continuing to expand its more upscale core hotel brands Grand Aston, Aston, and Aston City Hotels throughout Indonesia's vast archipelago the group also focuses on Indonesia's budget hotel segment were it already operates 16 favehotels, plans to open another 27 faves and NEOs in 2013 and has a strong pipeline beyond next year with more than 30 hotels set to open by 2014 and 2015. Aston Internationals Vice President of Sales & Marketing, Mr. Norbert Vas, said: “Aston entered Indonesia 15 years ago with one hotel in Bali. Back then in 1997, foreigners where leaving the county and global hotel chains had their eyes fixed on China not recognizing Indonesia's potential. We stayed, settled down and made Indonesia our home, learned the language and local ways and were firm believers in Indonesia's future with a strong desire to be part of it. We now have thanks to our local partners grown to more than 60 operating hotels with a construction pipeline of more than 12.000 rooms and enjoy industry leading occupancy levels and guest loyalty throughout our entire system.”. 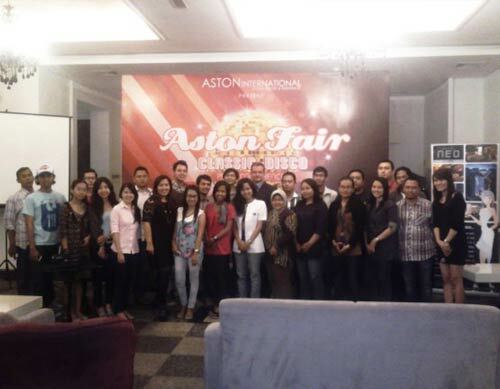 Snapshot of Aston Fair 2012 Press Conference, seen in the picture Mr. Norbert Vas – Vice President Sales & Marketing of Aston International, Aston Public Relations team from Jakarta with Surabaya media. 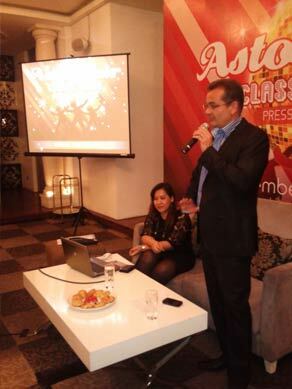 Snapshoot of Aston Fair 2012 Press Conference, seen in the picture Mr. Norbert Vas – Vice President Sales & Marketing of Aston International giving Aston Group's Business Development presentation. Aston's brands cover the entire spectrum of the accommodation market and range from ultra luxurious private pool villas to serviced apartments and select service economy class hotels, thus offering travelers Indonesia's vastast and most comprehensive hotel network.